August is traditionally the hottest month of the year. If it beats this July, it will be a bugger. When it is hot, you don't want to spend a lot of time over a hot stove cooking up the regular fare. My family always turned to something lighter and cooler for the "simmer" months. I recently came upon some canned salmon that is not the regulation canned salmon you think of. It is not the bones-in salmon that's used for making salmon patties. This salmon is in flaky chunks just perfect for salmon salad. Drain the salmon, put in a mixing bowl and flake with a fork. Don't turn it into mush; be gentle. Stir in the onion and relish. Add the egg and dressing and give a sprinkle of celery seed. Toss well. You may add or subtract dressing according to your taste. Put the salad in a sealed container and chill no less than four hours in the icebox or better still, overnight. The flavors like to marry or at least form a common law marriage. You can add other things to the mix according to your taste and the contents of your icebox. A bit of fine dice red bell pepper or pimento will improve the visual appeal. Some green bell pepper will spike the flavor. My favorite way of serving this salmon salad is between two slices of white bread with a bit of lettuce. 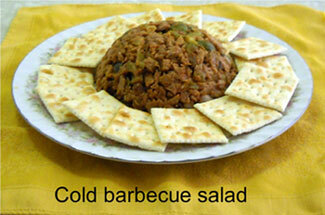 Or, you can serve it on a bed of lettuce along with crackers or Melba toast. I guess you could eat it with potato chips or corn chips if you like. It's made just like the above salmon salad. Just substitute chunk tuna for the salmon. Chicken salad also uses the above method. There is canned chicken out there, but to me it has no flavor and will not accept flavoring. So while you are gone to the mall, make your husband or wife boil a chicken for the salad. You want to boil a whole chicken or select pieces in a large pot of water flavored with onion, celery and black pepper. You boil the chicken until it is done, and then let it cool and remove all the skin and other objectionable materials and dice the meat for your salad. This has been standard fare for large gatherings in Central Texas for a long time. It is served as a sandwich with just lettuce, but you have to cut the sandwiches into triangles. I have never seen a square or rectangular chicken salad sandwich. I don't hold a patent on beef salad, but I have never seen anyone else make this. You start out with some lean beef such as brisket or round or rump. Boil it in a large pot along with onion, garlic and black pepper or peppercorns. How much depends on how big a pot you are cooking. When the beef is very tender, remove it from the liquid and let it cool. Then you can chop it with a knife or run it through the food processor, as long as you do not make mush of it. Best is to grind it with the large blade on the old hand cranked food grinder. No, you can't start with hamburger. Use the same condiments as the chicken and salmon salads. You may want a tad of fine chopped dill pickle in it. I would omit the celery seed. For many years the most popular item in Texas barbecue joints was the chopped beef sandwich. It was popular because it was the lowest priced thing on the menu board, and it cost the joint owner very little to produce. The chopped beef was trimmings off the briskets that were either too small or too ugly to put on the plate. The slicer would save up these trimmings and, when he had a little spare time, he would chop them fine and add some sauce and warm the mix up. The chopped beef sandwich was some of this mixture served on a hamburger bun with onions and pickles. They always came on a hamburger bun because the bun would soak up more grease than the white bread used in the brisket sandwiches. When I started this article, I thought it would be good to include something in the barbecue line. I knew the chopped beef would not work as it is about half fat and would turn into a seasoned lump of lard when cooled. So here is how I did it. In a large mixing bowl (always use a bigger mixing bowl than you think you need; this keeps stuff off the floor and cabinet top), mix the chopped beef and the onion and pickle. Add the sauce and mix real well. Seal it and put it in the icebox overnight. Serve as a stand alone salad with bread or buns or as paté with crackers or chips. To make the salad attractive if you are having company, mix in about a third of a cup of fine diced red, yellow and green bell peppers. We are just looking for color here, not flavor, so don't overdo it. There we have the stars of your hot summer meals. They work at the table, at a party or on a picnic. Just remember that the salads need to stay cool. When you use lettuce with them, make sure it is fresh, cool and dry.